Orli Shaham guest hosts NPR's "From The Top"
The pianist Orli Shaham is guest host on From the Top, NPR's nationally-broadcast showcase for young classically-trained musicians. The live taping of the show on Wednesday, October 17, 2018 is at Bowdoin College in Brunswick, Maine. This episode of From the Top will air on participating radio stations during the week of December 17, 2018, and will be available as a podcast. Orli Shaham will accompany and interview six extraordinary young musicians from across the country in this 90-minute live concert recording. In addition, Ms. Shaham will perform a movement from the Sonata in C Major, K. 330 by Mozart. 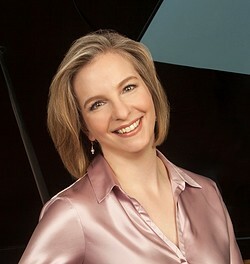 The pianist Orli Shaham has established an impressive international reputation as one of today's most gifted pianists. The New York Times called her a "brilliant pianist"; Ms. Shaham is admired worldwide for her interpretations of both standard and modern repertoire. Ms. Shaham's interactive concert series for young children, Baby Got Bach, founded in 2010, is recognized by parents, media and the music community as a significant force in music education and entertainment for preschoolers. Ms. Shaham's discography includes "Brahms Inspired", "American Grace", "Nigunim - Hebrew Melodies" with her brother Gil Shaham, and "Alberto Ginastera - One Hundred" among others. Broadcast on more than 220 stations nationwide to an audience of nearly half a million listeners, From the Top is the most popular weekly one-hour music program on public radio. Young performers share their passion for classical music, and speak about their non-musical lives, from career goals and family to hidden talents, school, and community life. From the Top appeals to diverse audiences, but is especially suited for ages 7 and up.